Slowly but surely we're decking the halls around here, and we finally have the living room done. I love this time of year but I don't want it overdone. We have a small house. Let me repeat, we have a small house. Too many decorations and it looks cluttered and messy. I hate messy! So we keep it simple around here. Simple I can do. Life is so busy and its hard enough to focus on Christ this time of year. We don't need decor getting in the way or adding to the overwhelmed feelings that can creep in. 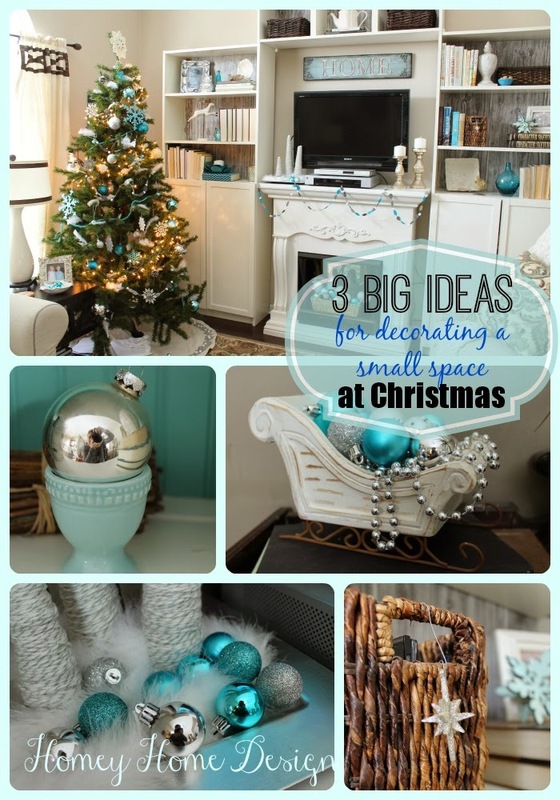 Here are a few ideas for decorating small space for Christmas. 1. Try to stick as closely as you can to your regular decor colors. If you have a lot of colors it adds to the busyness of the things and can overwhelm your eye. If you have a lot of color already in your everyday decor just add silver or gold for your scheme. 2. To help your simple decor take center stage, turn your books around. This way the colors/content of the books spines are competing with the holiday items. Your eye goes to them first. 3. Consider taking out bulkier items to maintain flow once the tree comes in. We will often take out our coffee table for the month of December. Its amazing how much bigger the room feels with this gone, once you get the tree up and other decor in place. Some years we will put the tree where the chair is and put that in the basement. Here's last years tutorial on how to make these trees out of cereal boxes. This felt garland was made here, and a version of it also decks out the tree. To make this Pottery Barn knock off check out this tutorial here. So if you can't keep your schedule simple, at least keep the decorations from taking over! Thanks for stopping by!